Registration is now open for Photoshop for Mural Artists: An Introduction. This three-part series will provide visual and mural artists with basic skills to incorporate Photoshop into their artistic practice. What: This three-part workshop series will provide an introduction to Photoshop for visual artists. Learn basic skills such as menus, tools, palettes, and layers from an experienced graphic designer and mural artist. Walk away with new skills to support your artistic practice, and the ability to present your design on a wall for your next mural proposal. 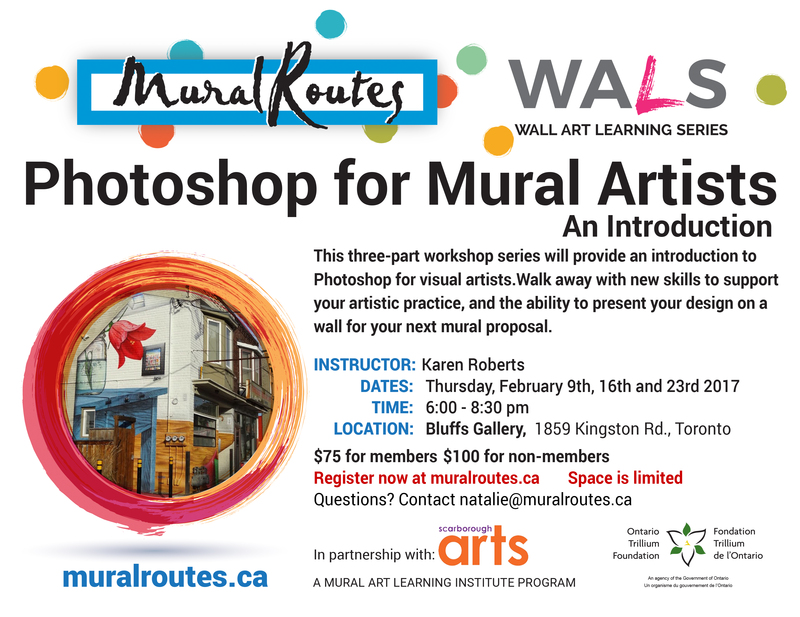 Registration: $75 for Mural Routes members or Scarborough Arts members, $100 for non-members. Register below. Contact natalie@muralroutes.ca with any questions. Includes three workshops, with light refreshments provided at each. Note: Participants are asked to bring their own laptop with Photoshop (a free trial version can be downloaded here). A very limited number of laptops will be available for loan, please contact us if you are unable to bring your own laptop. This workshop is being held in partnership with Scarborough Arts.